Today's outfit is no surprise - it is my every day uniform. I like to wear ripped jeans and floral a little too much ( its seriously an obsession ). I have been eyeing this jacket for a while now, and finally got it! I hesitate to buy jackets around this time of year because I know I won't really need them as the days get hotter. However, I can not resist a great floral print ! Those shoes are absolutely gorgeous! Love this look! The color on your sandals are striking! So pretty, and I adore your floral jacket. 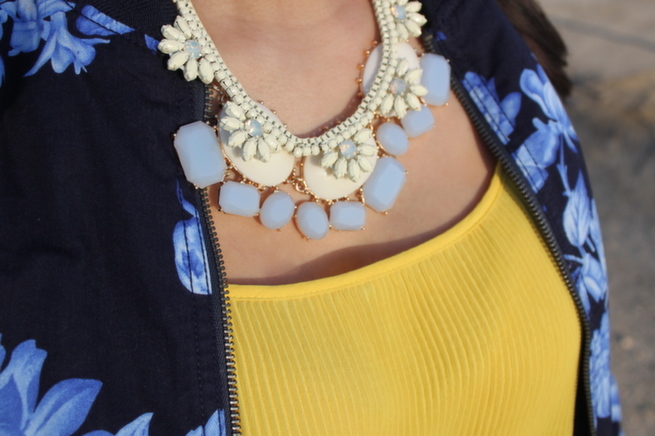 Love this... your necklaces are perfect with this look!